This weekends forecast calls for snow and ice storms, particularly Saturday into Sunday for the entirety of New England. Because it is still early, there are HUGE variances in the amounts of snow and ice predicted, which is frustrating, but there is little doubt we will be getting hit head on by this winter's first major snow event. There is also pretty much consensus that the coast is likely to see flooding and severe icing, which is definitely something to be aware of if you are on the coast or have travel plans or work obligations in the metro Boston or Providence areas. We will try and keep you updated on expected impacts & developments on our social channels as the models become more predictive. If you're expecting a delivery, please make sure you are using fill ports that are properly coded, and make sure the pathway to the fill is cleared of snow and ice so your driver can make the delivery as quickly and safely as possible. (If you're at home, the same goes for making sure your fill pipe is accessible and there is a clear path to access). The easier it is for your driver to deliver, the quicker he can get home and off the roads himself. If you run backup generators, we highly recommend ensuring they are operational and fueled up prior to the incoming storm. Several of the projected forecasts are prediction damaging ice accumulation and high winds, so it is entirely possible large numbers of New Englander's could lose power. You definitely don't want to miss the Pats game, so make sure you and your generator are ready to go. 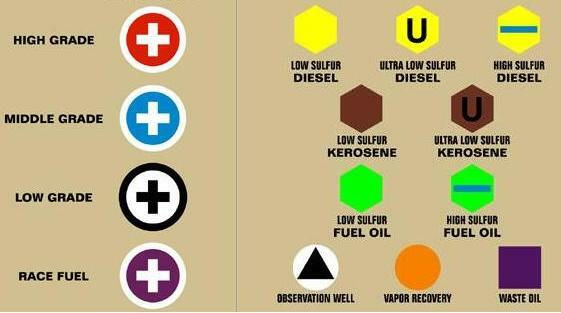 Below is a refresher on the API fill port coding. Stay warm & safe out there & GO PATRIOTS!